So I finally rented Dishonored to see if me pining over it was worth it...and yeah, it is. The game is really good. I love that you can kill or stealth your way through the game. Given how easy you can find ways to go around (or over) all the guys, the game really feels like it lets you choose how to go through. So far, it's better than Deus Ex in that regard (since there are no bosses in Dishonored). I almost bought it when it was $25, but I wanted to try it first and I should just wait to save the money. It will drop more than that by the time I get around to playing it, but I look forward to getting it eventually. Recently, Xbox has been having the end of the year sale, and I've picked up Hell Yeah! : Wrath of the Dead Rabbit and Mark of the Ninja. In a day or two I will snag Dust: An Elysian Tale (all 3 of these were 50% off, making it a good deal). I would have picked up the Simpsons Arcade game, but it was only 25% off, so I'll just wait for 50% off again. I think Mark of the Ninja will hold my stealth itch until I can buy Dishonored. 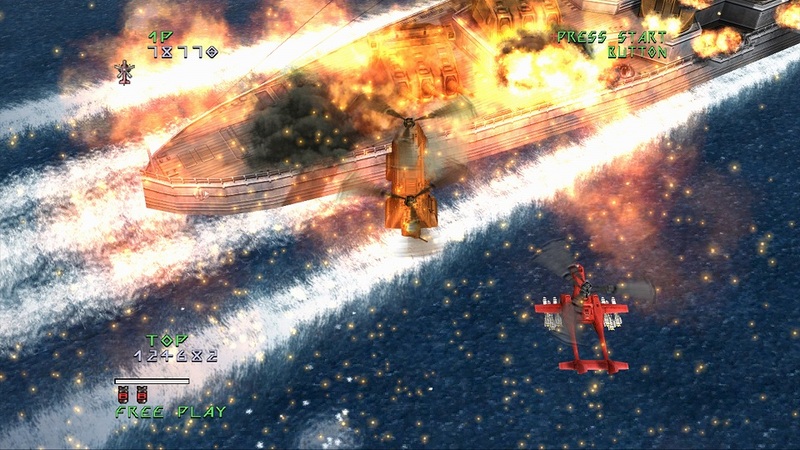 Hell Yeah is fun too, but some of the minigames to kill the monsters are annoying. Most are press A at the right time or mash a button, but a few require something else, and it can take a few crucial seconds to orient yourself to what's going on. That part reminds me of the Warioware games, where it can be frustrating when you don't know what to expect the first time you run across a game. It's not game breaking, but annoying. Also, you can apparently only go to the island (where you can get things from the monsters you have killed) from the menu, which is strange. I'd like better stopping points, since all levels run into each other, meaning you just have to stop after an autosave point. I'm liking it so far though, the game is funny and colorful (bloody). I should also have another review for you in the next few days, so keep an eye out for that! This weekend, as the title describes, had it moments, but also sucked really bad. On Friday night, I finally beat the final urgent mission in Monster Hunter Tri (spoilers for those who check out my Youtube channel). It wasn't by myself, of course. I was playing with a fan of said videos and some of his buddies, and the four of us emerged victorious. I didn't make a fool of myself, which was pretty good. They were obviously much better at the fight than I was, but that will come with more experience with the monster. Now only one monster left until I feel ready for MH3U! The sad part of the weekend? It was the close of City of Heroes later that night. Despite having work early the next morning, I had to stay up and say goodbye to such a great game. Figuring out which character to see the end with and where to do it was a hard decision. Do I say goodbye with my first lv 50 hero? My first lv 50 villain? What about the first character I created? What about the one I had the most fun with? The one that didn't get his chance to shine? In the end, I sadly passed up my scrapper, peacebringer, warshade and brute to go with my main villain, Gear Master J. He was one of my first concepts, but probably my third created character. I started with villains and on launch day made my first three characters instantly, mostly to get the names for the first two. Well, actually my first character was created to get the global name I wanted, but I don't really count him. Anyway, Gear Master was my first and only lv 50 villain, based a bit off of me, and was tons of fun. So where should he see the end? Most people gathered in Atlas Park, so I wouldn't want to go there. Plus, I'm a villain, so I can't. How about the villain starting or ending zone? They aren't as memorable to me as some of the other zones. Eventually, I decided upon Ouroboros. The place deals with time travel, which is a subject I like, so why not? Also most of the plot there revolves around "the coming storm", so it seemed very appropriate. I used "/demorecord" to try and capture the final minutes, I'm just not sure how to view it yet. I also took lots of pictures. As midnight rolled around, many said there goodbyes and lamented the game getting killed. It seems as though the servers were turned off one by one, since it took a few minutes for Guardian to go down for good. For yucks I logged in real quick again, and was greeted with this sad sight. Freedom, was apparently, the last to go. As I've said time and time again, this was a sad time. The game was really fun and there isn't anything that can fill the void it leaves. The other two superhero MMOs just don't compare to the sheer amount of fun, creativity and content of City of Heroes. I backed up all my characters with the Sentinel program, just in case there is a way to bring them back to life. It's the comic way! Still, I wish there was some way to get a single player/ LAN capable version of the game, as that would be perfect. I'd easily buy one (two) if I could. 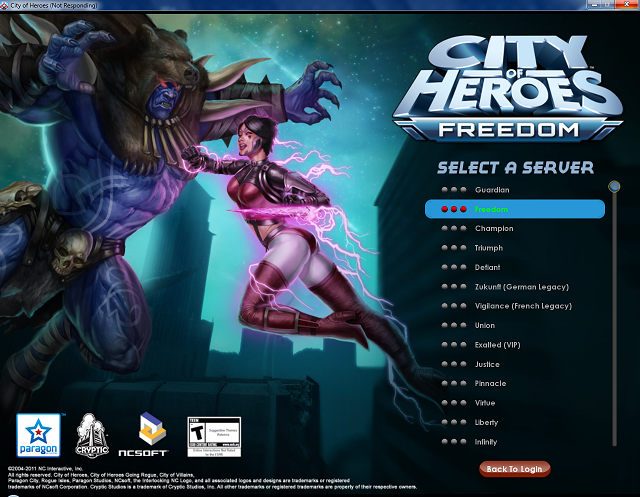 City of Heroes and Paragon studios, thank you again for the great game. I hope to make a video about CoH in the near future. Lastly, on Sunday I scored a spectacular deal on a handful of games. Lack of money or not, I couldn't pass up the deal I got. Thankfully, I'm getting some money for Christmas, so that pretty much went to this. Basically, I scored a lot of games for about $5 each. I guess we'll have a good Christmas after all!